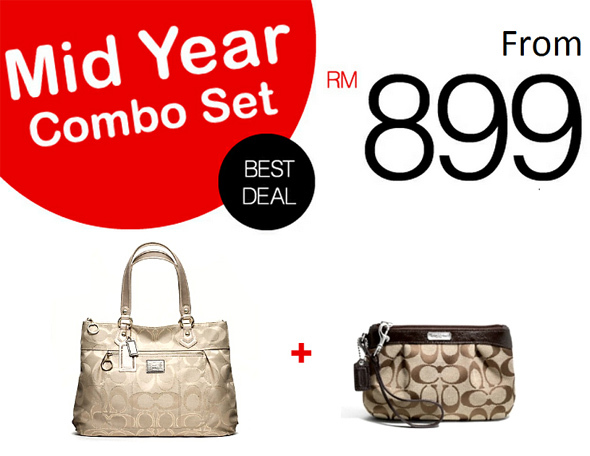 Luxurycometrue.com is having great combo set of Coach bags from RM899 only. Hurry up, visit http://www.luxurycometrue.com/products-special-price.asp now! First come first serve! Luxurycometrue.com is Malaysia leading luxury online shop that selling imported brand new 100% authentic and genuine brands for less including Coach Bags, Burberry bags, Louis Vuitton bags, Gucci bags, LongChamp bags, Prada bags, Kate Spade, Bottega Veneta, Marc By Marc Jacobs with varies categories. Luxurycometrue.com serving clients from Kuala Lumpur, Selangor, Sabah , Sarawak , Labuan , Penang, Kedah, Perlis, Pahang, Kelantan, Terengganu, Negeri Sembilan, Malacca, Johor as well as Singapore and Brunie.